All the staff are so lovely and caring. I cannot begin to praise this dental practice enough. Graham and his whole team are brilliant in every way. My whole family have been coming here for well over 25 years, and will most certainly continue to do so. I went to see Dr Frans Banki in April to try some anti-wrinkle injections and have been so pleased with the results as well as the treatment. The injections were not painful at all and the results are fantastic. Dr Banki was lovely and explained every aspect of the treatment which put me at great ease. I also felt reassured as Dr Banki is a medical doctor and with treatments like these I feel personally this is important. Two months on and still loving the results, 48 and wrinkle free!! Definitely recommend Dr Banki to anyone wanting to try this treatment. 5 stars ! Really pleasant, clean and welcoming practice. Efficiently runs to time which helps with our busy lives! Always friendly staff from receptionist to the dental team. We have been patients at the practice for many years. The level of service is outstanding and the staff are friendly and welcoming. Always helpful and first class treatment. Excellent treatment would recommend to anyone. Service is consistently excellent and very clear. All aspects of treatments explained before, after and during treatment. Staff are always very friendly and put you at ease. I was very nervous going for my first appointment having not been to a dentist for several years. I had built up a fear in my head which is now completely gone, so much so that I have not only had my teeth "brought up to speed" but have had teeth whitening and an implant, at my instigation, illustrating my new found ease. I whole heartedly recommend this practice. I have been a patient of the practice for the past 35 years and have been utterly and totally looked after in every sense as a child, an adult, in pregnancy and now for my children. I have complete faith in my dentist Graham keeling for my family's whole dental health. Not only for solving problems but for preventing problems occurring and taking care of everything. As a dentist Graham is such a wonderful, gentle dentist who puts me at ease no matter how nervous I feel. The way he does his treatment is a dream and makes it as easy and relaxing as possible. The whole team are so helpful with arranging or re-arranging appointments and nothing is too much bother. I feel very lucky to be on their books. I'm very pleased with the treatment that I've received from Graham Keeling at Rottingdean Dental Care. The results are what I'd hoped for. I would recommend this practice to friends and family. I have been a patient for more than 10 years and have always been totally satisfied with the service I have received. My school time experiences of dentists was horrific but this practice has eased me through both complex and routine work with a professional yet friendly manner. I am ultra-sensitive to pain but Graham who has been my dentist throughout is well aware of this problem and goes to great lengths to ensure that I do not suffer. The practice has a policy of explaining and pricing all treatment before it is commenced with a clear illustration of its total integrity. My husband and I have been patients of Graham's for 24 years and have followed him from Worthing, to Ferring and finally to Rottingdean. I have delicate teeth and Graham has looked after them very well over the years and all treatments have been successful and carried out gently with consideration and reassuring information. I would not hesitate to recommend this practice. My favourite dentist- always get top class dental care with Graham and Donna-Marie. Although I have moved some distance away from Rottingdean I have continued as a patient as the care and service is excellent. From the moment you arrive you are made very welcome by the reception team. The care received from the dentists and nurses is outstanding. Very friendly and knowledgeable staff who show sensitivity and understanding to people who get nervous at the dentist! Excellent, professional care and friendly staff from reception to the dentist himself! Best dental care in Brighton. Always great service. I can't recommend this practice enough, visiting as a new patient and requiring treatment for a broken crown and veneer fit. Dr Graham Keeling is a very caring, honest and professional dentist, excelling in reassuring me as a patient and giving me advice and explanations of work being carried out every step of the way. His dental nurse was very professional and caring and I found the reception staff to be most welcoming and approachable. Thank you very much for your outstanding treatment, I am delighted with the results. My family and I have been patients at Rottingdean Dental Care for 12 years. We make a 3 hour round trip, but our peace of mind and the excellent, sympathetic treatment we receive makes it worth it. We are always treated promptly and efficiently when emergencies arise and receive expert advice. My Husband & I have been patients of Graham Keeling for approximately 25 years. We have always found him to be very professional and courteous, with attention to detail. We would have no hesitation in recommending him to anyone. 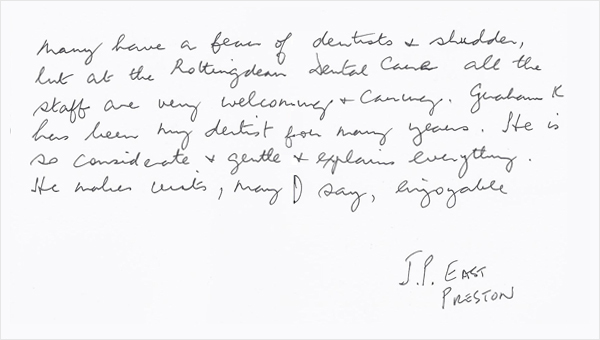 I have attended Rottingdean Dental Care for the past 30 years and I have found the patient service second to none. They always offer excellent care and attention and I would highly recommend the practice to anyone. I have been a patient with the practice for many years and all of the staff are very friendly and welcoming. My son also attends and has nothing but good things to say as well. Thank you all at Rottingdean Dental Care. I am very pleased with the treatment my dentist Tess provided. Very efficient and friendly, and kept fully informed at all times. My Husband and I first used Donna-Marie's expertise some 15 years ago when we moved to East Sussex. We find her professional, effective, helpful and advisory in her manner and application, and undoubtedly will continue to do so. I have been a patient at Rottingdean Dental Care for almost two decades. The practice building is pleasantly quirky and the staff give it a friendly, calm and professional atmosphere. Treatments are always done with consideration and care. Following a couple of treatments that cost largish amounts(crowns), I took up the Denplan option a couple of years ago. The regular instalments now pay for my dental care.I highly recommend Dr Keeling and Dr Costigan's Rottingdean Dental Care practice. I have been a patient at this dental practice for many years and have always found the reception staff friendly and helpful at all times. My dentist Ms Costigan has always been caring and professional towards whatever treatment plan has been in place for me. I started to see Donna-Marie in 2011 and about a year later I began treatment to have some dental implants. This is a big investment and in 2014 I decided to see Donna–Marie every three months both to protect my implants and keep my own teeth in a stable condition. I regard Donna-Marie's care as essential to maintaining a high standard of dental hygiene. On a personal level, there is always a warm welcome and she has an easy manner that set patients at ease. She is happy to chat away without expecting a response and I never leave without having shared some amusing incident. She is part of an impressive team at Rottingdean Dental Care where everybody is dedicated to the best patient care. It gives me great pleasure to recommend Rottingdean Dental Care retain the Investors in People (IIP) Standard. All of the people should feel extremely proud of this achievement as this is a direct result of their commitment and support. Teamwork was described as the key to ensuring patient care remains at the heart of the practice. Everyone is completely committed to supporting people within the team to enable them to effectively engage with the patients. People feel encouraged and empowered by the Directors and managers and this has led to them feeling a strong sense of ownership within their roles that clearly supports the practice. The dedication and access towards learning and development, and the encouragement people have towards focusing on their professional development, was described as essential to the delivery of their services and as well as meeting their own aspirations. 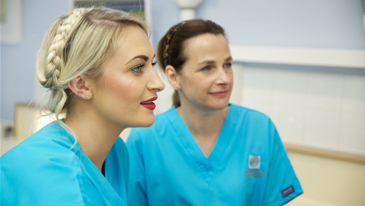 "Learning is part of what we do every day and we take the opportunity to share information we have learnt that we feel our team will benefit from"
I have been a locum dental nurse for years now. I have worked in over 30 practices. I adore Rottingdean dental practice there is no comparison anywhere on the south coast. They are simply the best practice in every way. They have the most professional and caring team, they work together like nothing I've ever seen. Graham, Lisa and Eadin are absolutely the most talented and excellent dentists I have ever had the pleasure of working with. Sadly I now live in the Midlands but I will say this practice made me a better nurse, more caring, more efficient and above all more mature. I am always very proud to say I have been part of this team. I have been a patient of Lisa Costigan for many years. During all that time she and the staff have always been very helpful, kind and caring as well as being very efficient. I do hope the surgery will carry on for many years! Clean, bright premises. Easy access. Friendly and helpful reception staff. Professional and caring dentists. I've been a patient for 25 years and wouldn't go anywhere else! Thanks particularly to Lisa Costigan who treats me, my wife and, until she left home, our daughter. I have been with Graham Keeling and his great team for a decade of care and kind considerate treatment. Both the treatment and the aftercare provided are outstanding. What a welcome! Two smiling receptionists who put me at my ease straight away. I’ve never had such a good dental experience! 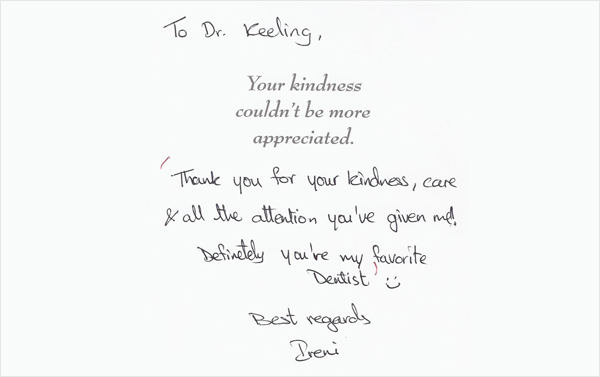 The dentist Dr Keeling was superb and put me totally at ease with his kind manner. His dental nurse was equally professional and comforting. 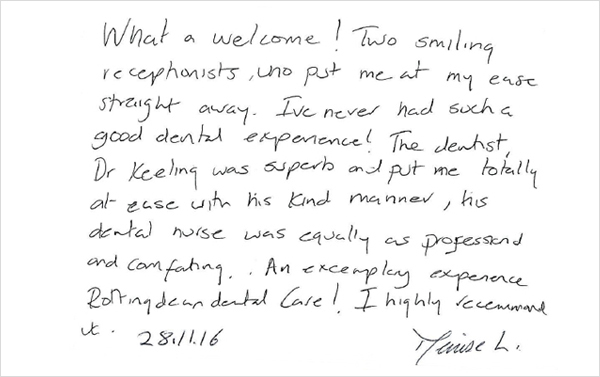 An exemplary experience Rottingdean Dental Care! Always kind and very professional. I would recommend this surgery. Thank you for being such a gentle dentist! It makes such a difference. I would like to thank everyone who has helped me over the years. Your care and compassion have been second to none. A very big thank you to Graham who has taken me from having sedation for everything, to being able to cope without it. Thank you for your kindness, care and all the attention you've given me. Definitely you're my favourite dentist. The smart Fisherman's Cottage has an almost “Alice in Wonderland, come in and try me look" about it. But the it was the’ Investors In People’ sign that confirmed that I should try the practice, since I know from personal experience how much effort is needed to get this accreditation. There was a warm welcome from the reception staff. This first impression is important and the decision to use the practice has been confirmed by the excellent treatment. It is the team effort by everybody in the practice that stands out, from the reception staff, hygienist, dental nurses and the dentists. There is a lot of hard work and training that comes together to create a team dedicated to exceptional patient care: The practice is very efficient and professional at all levels but it is also a pleasant place to visit and this is entirely due to all the staff being committed to putting the patients at the centre of everything they do. But it is more than just high professional standards, it is also obviously a happy working atmosphere for all the staff and this makes it a very relaxing place for patients. I'm not nervous about dental treatment but I am still very aware of the efforts to make patients as comfortable as possible during the dental-treatments. I was treated with dignity and respect at all times. I took a step into the unknown some months ago with the decision to have dental implants in association with The Implant Centre in Hove. Both practices have worked together at a level that seems almost impossible. I don't like to think about the treatment that has been done but it has been entirely painless and trouble free. I will be eternally grateful for the advice you gave me about this treatment and the outcome. Care Quality Commission (CQC) Report 2015. We spoke with four patients who used the service. They were all happy with the care and treatment they received and the way in which it was delivered. One patient told us, "It's a wonderful place to come. The care is first class". Patients told us the dentist always discussed treatment options with them after initial examination. Our observations confirmed this. One patient said, "I really feel that they (staff) take this seriously". Another patient told us, "I'm never left feeling in the dark. They (staff) explain everything and leave the final decision to me"
The patients we spoke with were happy with the treatment and care given. One patient said, "I always know what to expect when I go there and that's brilliant care". Another told us" I don't think I could go anywhere else now". One staff member told us " I love it here. I can only work somewhere with very high standards and this really suits me"
Care Quality Commission (CQC) Report 2012. 'Nothing is too much trouble. You definitely feel that he (the dentist) has your best interests at heart. Everyone at the practice is so kind and friendly'. 'I've had some restructuring work done there and it's been fantastic and made such a difference. I'm absolutely delighted'. 'I must admit that I once fell asleep in the chair, it really is just such a totally relaxing experience. My children also go there now and they are more than happy'……. As part of the review process we spoke with people who used the practice. They told us that they were fully involved in discussions about their treatment, including any other possible options available. They said that they felt they had enough time and received sufficient information to make a decision about their individual treatment. All the patients that we spoke with were positive about the treatment and support they had received and they confirmed that they had been treated with 'kindness, dignity and respect'. They also told us that they found the practice was comfortable and accommodating and that appointments were flexible to meet their needs. People we spoke with who attended the practice told us that they were very satisfied with the service provided. They said that they found the dentists and staff to be friendly and helpful and they were treated with respect and their privacy was maintained. This was also evident from direct observation of effective interaction and of individuals being supported in a professional, sensitive and respectful manner. People told us that they were given sufficient information about their treatment options and the relevant fees and were able to ask any questions or raise any issues or concerns that they might have: 'The dentist always explains everything about the treatment that I need and I have total confidence in him. Everyone there is so helpful, friendly and reassuring'. Many have a fear of dentists and shudder, but at Rottingdean Dental Care all staff are welcoming and caring. Graham Keeling has been my dentist for many years. He is so considerate and gentle, and explains everything. He makes visits may I say enjoyable.